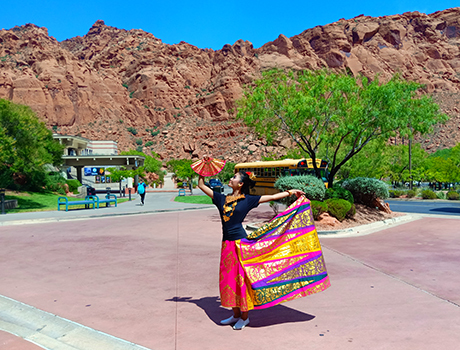 PAX is pleased to nominate Putu (Dea) Kartini, a YES exchange student from Indonesia and St. George, UT to be the November YES Student of the Month. Dea has been extremely active in sharing her culture since her arrival. She looked for an opportunity to celebrate Indonesian Independence Day, and when she found nothing locally, she created her own! She took her flag to school; she taught her new friends to say "Happy Indonesian Independence Day" in her language and made a video of her celebration all around the school. She also celebrated National Batik Day by wearing batik clothes and sharing about the special day. For a school talent show, Dea performed her native Indonesian dance during the very first week of school! With her host family containing eight family members, Dea helps out and shares her culture at home by cooking a meal for her host family every Monday night. Although she did not know how to cook before she arrived, she is seeking out her national recipes and ingredients and making delicious meals for her family, which they love. Dea is attending a charter high school for the performing arts and is enrolled in English, Biology, U.S. History, Government, and Earth Science. She also takes Dance, Art, Painting, and Design classes as electives. For a fashion design assignment, Dea used the concept of “iconic buildings of Indonesia” for her pieces, to introduce her country in a fresh way. Despite her very full schedule, she is receiving all A’s and still finds time to volunteer! Dea has already completed 22 volunteer service hours—at the local hospital open house, Children’s Museum, and Family Support Center. In October, Dea and her exchange student cluster volunteered at the finish line of the St. George Marathon and completed the Mayor’s Walk. She and other Indonesian exchange students are looking into fundraising options for the tsunami disaster in her home country. Dea is an outgoing, cheerful girl who loves her country and is always willing to share about Indonesia. Now she is learning to love the United States, too. We are sure that Dea will continue to accomplish great things this program year! It is with pride that PAX nominates Putu (Dea) Kartini as YES November Student of the Month.